Teki, em i wanpela kantri long Yurop, Esia. ↑ Turkish Statistical Institute. Turkstat.gov.tr. Retrieved on 2011-05-16. ↑ 2.0 2.1 2.2 2.3 IMF World Economic Outlook Database, April 2011. IMF staff estimates for the GDP figures of 2010. ↑ Human Development Report 2010 (PDF). Retrieved on 2010-11-01. 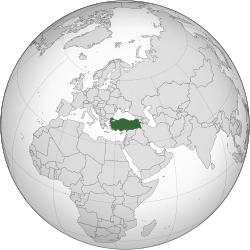 ↑ The Turkish lira (Türk Lirası, TL) replaced the Turkish new lira on January 1, 2009.